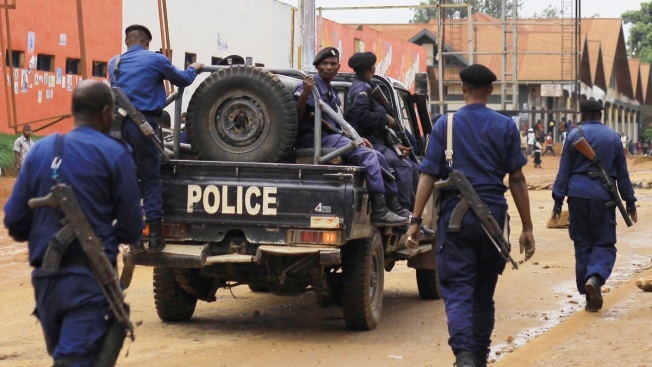 Congolese police move to quell protests in the Eastern Congolese town of Beni, Friday Dec. 28, 2018, as they demonstrate against the election postponed until March 2019, announced by Congo's electoral commission for Beni residents that is blamed on a deadly Ebola outbreak. Congo's leader Joseph Kabila has blamed a deadly Ebola virus outbreak for the last-minute decision to keep an estimated 1 million voters from the polls in Sunday's long-delayed presidential election. Health workers battling Ebola in eastern Congo are facing "a climate of deepening community mistrust" nearly seven months after the outbreak began, Doctors Without Borders warned Thursday. The medical aid group has temporarily suspended its operations at two treatment centers located in the epidemic's epicenter after both were set ablaze by unknown attackers. There have been some "30 different incidents and attacks against elements of the response" in eastern Congo, the medical group's president Joanne Liu told reporters in Geneva on Thursday. "The existing atmosphere can only be described as toxic," she said. "It shows how the response has failed to listen and act on the needs of those most affected." As a result, people are still reluctant to bring the sick to treatment centers. More than 40 percent of the deaths are still taking place in communities rather than at Ebola treatment centers, according to the group, also known by its French acronym MSF. The use of security forces in the area is also complicating efforts, she said. "Using police to force people into complying with health measures Is not only unethical it's totally counterproductive," she said. Congo has seen periodic outbreaks of the Ebola virus since it was first identified in 1976, though its latest epidemic has now become the second most deadly in history worldwide. At least 569 people have died among the 907 confirmed and probable cases, according to the World Health Organization. The epidemic is taking place in a region of the world wracked by armed conflict for decades. A myriad of armed groups operate in eastern Congo, complicating efforts for the teams that go out into the communities to identify suspected cases of the disease. Health workers treating patients in the current epidemic have had far more tools at their disposal than they did back in 2014-2016 when more than 11,000 people died of Ebola in West Africa. This time around more than 80,000 people have been vaccinated against the disease.